Not Specified, Army, Canadian Infantry (1st Depot Battalion, Alberta Regiment). 1918-01-02 ? Private, Army, Canadian Infantry (31st Battalion). Uploader's Notes: Thomas O’Connor was born in Godmanchester in 1890 or 1891. 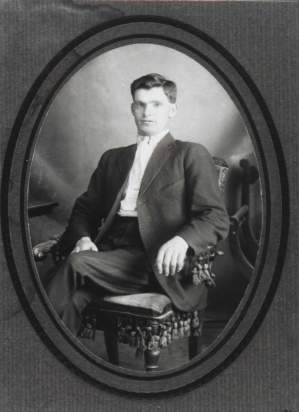 In late 1917 he was working as a farmer in Cabri Saskatchawan when he recieved his conscription notification. He was inducted into the First Depot Battalion, Alberta Regiment of the Canadian Expeditionary Force (C.E.F.) as a Private on January 2, 1918, went to England in March 1918 for advanced training, and was in France in late August 1918. He was wounded by a gas attack in the 2nd Battle of the Scarpe (Arras) on September 8th, 1918. He recovered and participated in the march across Belgium to participate in the occupation of Germany following the Armistice on 11 November, 1918. He was part of the first group of Canadians to march into Germany in late 1918. Thomas O’Connor survived the war and returned to Canada in April 1919. The story of his time during World War 1 can be found here.